WHAT MAKES K&S ARTISAN PIPING TIPS THE BEST? Anyone can claim they have professionally designed Piping Tips but not all can prove this! Don't Just Take Our Word For Our Quality. Our Reviews Will Prove This Too! 1) The K&S Artisan Nozzles are UNIQUE Deluxe Grade carefully selected Designs crafted with state of the art CNC machines, the K&S Artisan Tips are Hand Polished and finished to perfection. Each of our Nozzles are carefully inspected for any imperfections. Therefore we always Guarantee all our Nozzles! 2) K&S Artisan Nozzles are HEAVY DUTY not any Flimsy Tips they are Rust Proof thanks to the First-Level 304 (18/8) non-toxic Stainless Steel. FDA Approved-these Tips are all food safe and have been FDA approved & certified. 3) The K&S Artisan tips are EXTRA LARGE unlike competitors selling the large or medium size or even the small size and believe us you need the extra large size to make a beautiful flowers Easily and Quickly see our customers attempt images in the review section below! 4) One Batch Formed Seams, our Tips are Not welded in anyway they are formed completely in One batch so no welds needed making them much stronger and hard to bend making it comfortable to use and most importantly safe. 5) Thicker, K&S Artisan Tips are hard to bend They are made from carefully selected Stainless. 6) Safe for kids to use, our Tips have no sharp dangerous seams. 7) Comes with a Guide with every set to help you pick the right Nozzle for your baking needs. K&S Artisan brings high end quality products where quality is our GOLDEN RULE! so many pastry bags! along with 2 leaf tips that will help you to make BEAUTIFUL leaves around the flowers ✅ FDA Certified icing nozzles ,One Batch Forming,PURE 304 Food Grade Stainless Steel a GOLD standard in any industry NOT 201ss that will eventually rust ●✔BPA-Free●✔NO RUST ●✔ NO SEAMS ●✔DISHWASHER SAFE●✔ Plus INSTRUCTIONAL Online Videos! ✅ BEST BAKING SUPPLIES Decorate like a PRO! with our PROFESSIONAL & UNIQUE Cake piping kit You will have everything you need to start decorating your Cakes ,Cupcakes ,Muffins and Cookies or even Pie or Pastry! 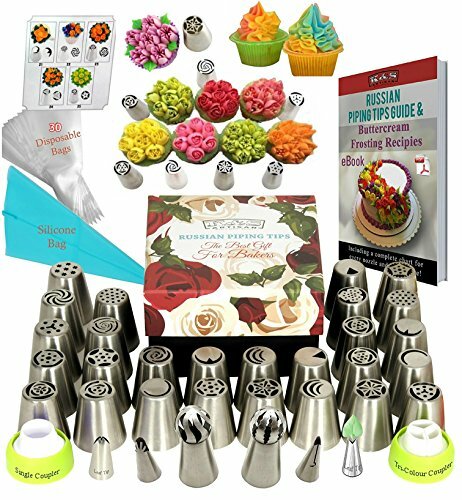 including ✅ 27 Professionally Chosen Beautiful Designs Different patterns Russian Piping Tips ✅ SINGLE Coupler ✅ Tri color coupler ✅ 2 LEAF Tips ✅ 2 SPHERE BALL tips✅ 2 RUFFLE Tips ✅ Reusable Silicone Bag ✅ Free 30 disposable pastry Icing Bags ✅ nicely printed Chart all in a ✅ GIFT BOX! ✅ QUALITY IS OUR GOLDEN RULE! Our Russian Nozzles are tested by thousands of customers not only few tens and be assured that you are buying the Genuine tips from a reputable and reliable manufacture: Extra LARGE cake piping Flower Icing Nozzles at height exactly what you need to make flowers with EASE and only ONE SQUEEZE! ✅ The ONLY complete set that include varieties of frosting nozzles and step by step instructions and USER GUIDE EBOOK alongside with online instructional videos! ✅ BONUS 2 SPHERE Ball tips & 2 RUFFLE tips for QUICK & EASY cupcake decorating dolls skirts and dresses cakes,Absolutely it is the only set that provide all variety of cake decorating tools PLUS User Guide FREE PDF e-BOOK including our best recommended frosting icing decorating recipes that will help you to make the right consistency buttercream recipe ✅ An awesome Gift Idea :●✔ in a Beautiful and EXCLUSIVELY designed for K&S Artisan brand GIFT BOX that will make you smile when you look at it! ✅ *A great wedding or housewarming gift or for any occasion - makes for a terrific and affordable gift. *It's easy to buy, easy to use and sure to bring tons of smiles, along with class and fun to someone's kitchen.✅ ● NOTE: You should receive the eBook In our very first email we send to you if you don't receive it then please email us on Amazon and we will send it right away. If you have any questions about this product by K&S Artisan, contact us by completing and submitting the form below. If you are looking for a specif part number, please include it with your message.